One of the sweetest Roots vocal talents must belong to the vastly overlooked Barry Brown. His militant conscious style has over time lost none of its appeal. Born in 1962, Kingston, Jamaica he cut his musical teeth working under producer Bunny Lee. Bunny Lee saw his potential and was rewarded with his 1979 cut ‘Step it up Youthman’. Which became a hit and has become a roots classic, leading to an album of the same name. and some unreleased gems that we believe should be heard. work hand in hand as there dubbed form. in 1980 followed in 1981 by ‘Problems Get You Down’. voiced at King Tubby’s studio. 2. WHY FIGHT THE DUB. Barry voicing over The Abyssinians ‘’Declaration of Rights’ rhythm. 4. LEGGO JAH JAH DUB. became Barry’s classic ‘Leggo Jah Jah Children’. 5. A LONELY DUB SONG. A rare dub to ‘Step it Up Youthman’...Nice. An unreleased cut see’s Barry working over Horace Andy’s ‘Zion Gate’ rhythm. Lost till now...you can here Bunny Lee on the run out confirming this point. A dub cut to Barry’s ‘It’s Struggling Time’. 9. LOVE IS THE DUB. An alternative dub cut to Barry’s ‘True Love is the Answer’. 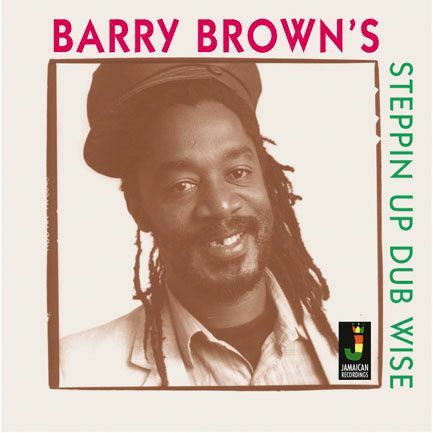 A lost till now dub to Barry Brown’s classic ‘From Creation’. Another Barry Brown original ‘Rocky’. This is the lost dub version. in fine form. This is a lost dub again unreleased. Cornell Campbell..this is a lost dub to ‘God father’. 3. LOVE IS THE DUB. Recorded at: Harry J’s, King Tubby’s Studio’s. Manufactured under Licence from: E.Lee.